References to ecclesiastical festivals, or ‘holy-days’ feature strongly in our collection of manuscript fragments. These are around 150 pieces of medieval and early modern manuscripts, primarily leaves from liturgical texts such as missals, breviaries, psalters, and bibles, but also including biblical commentaries and key legal and philosophical texts of the medieval period. 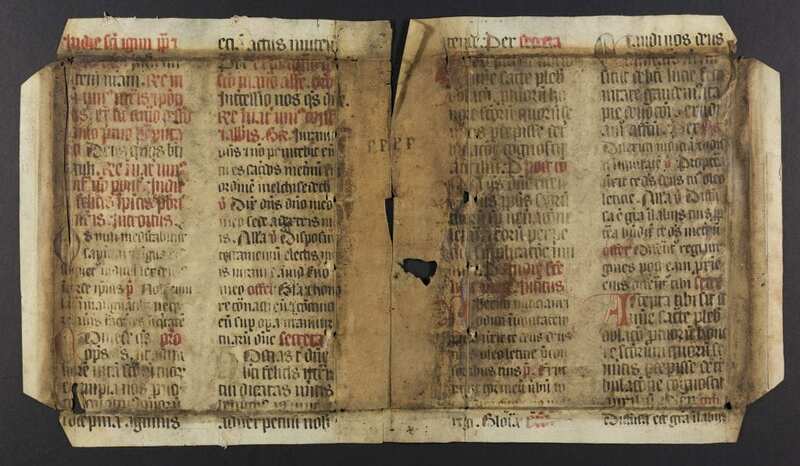 They exist as fragments because they were recycled as decorative covers and endpapers or to reinforce the binding of printed books, which was common practice from the end of the medieval period onwards. Most of our fragments were probably ‘rescued’ from bindings in the 20th century. Note the shape – it has been cut so that the edges form tabs to wrap around wooden boards. The tabs are much cleaner than the rest of the page because they were protected by being inside the book. Unfortunately, being on the inside hasn’t protected this piece, which was used as an end pastedown. The brown patches around the edges are remnants of leather binding from where it was glued to the inner surface of the board and some of the large decorated initial N has been lifted away by the adhesive. 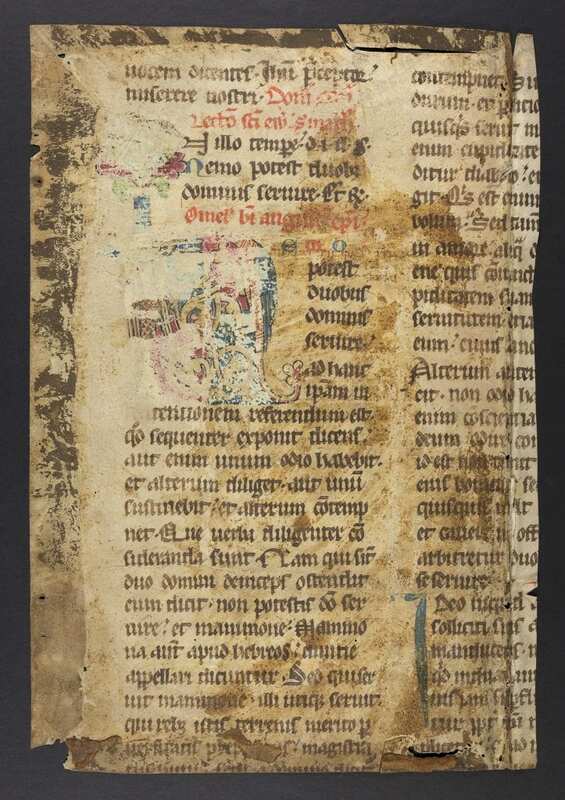 MS FRAG/LAT/62 Fragment of a Missal, C14th? This piece has a special relevance to this advent blog because it is a page from a missal (a book containing prayers, chants, readings and rubrics for the celebration of Mass) showing the text for the Mass on Christmas Eve. On the next line, and elsewhere on the page, you’ll notice a large gap where a decorated initial letter should be. This is because when manuscripts were made it was normal for the main text to be written first and the rubrics, initials and decoration to be added afterwards, sometimes by different people. In this example, the scribe has left a space for the capital H of “Hodie scietis” and other large initials but these were never completed. This raises questions about the original manuscript. Why was it left unfinished? What would it have looked like if it had been completed? Was this page ever used by a religious community to celebrate Christmas Eve? 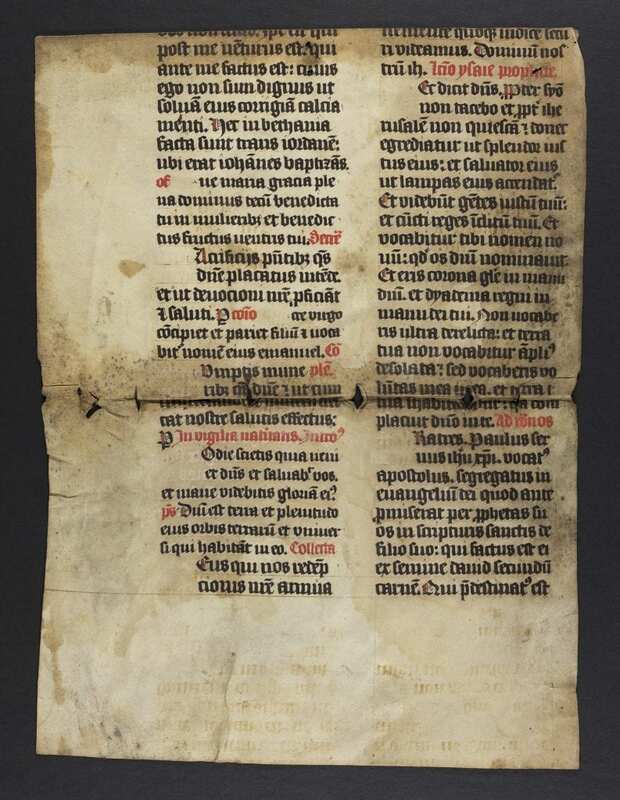 Whatever the answer, the fact is that this page, intended for use during Advent and Christmas, may be the only surviving piece of the original manuscript. Whether Christmas is to you a “holy day” or a “holiday”, it’s a poignant link to the past and the traditions that we continue to celebrate centuries later. 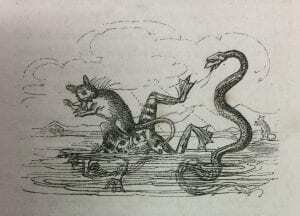 The whole of the MS Fragments collection has been digitised and will be available online soon. Advent Definitions: Don’t be a goose! December begins today, and with it we welcome you to Advent Definitions. 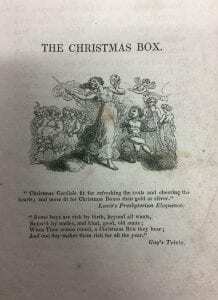 Each day this month, UCL Special Collections will be tweeting a festive word, together with a historical definition from our Rare English Dictionaries Collection. Linked to the tweets will be regular blogposts highlighting aspects of the department’s work with UCL’s treasure of archives, rare books and records. And this is the kind of comparison for which the Rare English Dictionaries Collection was put together. When I started as Rare-Books Librarian at UCL, I was immediately interested in a small collection of English-language dictionaries gathered by my predecessor. I had worked in the past as a lexicographer for the Oxford English Dictionary, and knew how helpful former dictionaries could be for researchers tackling the challenges of tracing English usage through time. As my colleagues and I worked through various other collections of books at UCL, I came across more and more English dictionaries, mostly from the 18th and 19th centuries. Individually these books were not as significant as treasures we already kept in some of our more famous named collections, such as the Ogden Collection with its strength in language and communication. But gradually it became clear that, put together and used as a single resource, the less prized dictionaries could enable research that simply wouldn’t be possible using single editions of titles we already held, so the Rare English Dictionaries Collection was formed. Most of the dictionaries in the Rare English Dictionaries Collection were published as ordinary household or student reference books, often intended to help with spelling or pronunciation. The title of Webster’s famous dictionary (which was to run into many editions over generations) indicates this: The people’s dictionary of the English language. As a consequence, it is rare for copies in multiple editions to have survived, but in our collection, you can trace the appearance or disappearance of individual words across 50 or even 100 years of publication of dictionaries by lexicographers such as Bailey, Ash, Dyche or Entick. Former definitions would often simply be reprinted in later editions until the point was reached when the discrepancy between the old definition and current usage of the time became too stark. Being able to trace this in our collection gives C21st readers invaluable insight into how the language has changed. Forming a usable collection takes a lot more than picking appealing books and putting them together. Our Conservation team, with the help of our invaluable volunteers from UCL and elsewhere alongside our placement students from Camberwell College of Arts, surveyed and cleaned the books. Our long-serving rare-books cataloguer Bill Lehm catalogued the collection before retiring after many years of wonderful work in UCL Library Services. I worked with academic staff to integrate the collection into UCL students’ curriculum, and we now hold regular classes with the collection for MA students studying English language. For the Advent Definitions project, I would like to thank two student volunteers – undergraduate Odile Panette and MA student Christopher Fripp – who researched and read selected dictionaries to produce a shortlist of their favourite dictionary entries related to advent, Christmas or the holiday season. Finally Steve Wright, head of our Enquiries Team, photographed the entries you will see in our tweets, and Helen Biggs has managed the process of bringing you your daily word. We hope you enjoy your daily advent definitions. To find out more about the dictionaries available, browse our catalogue by the shelfmark R 221 DICTIONARIES. And if you need convincing of the extraordinary power of keeping such material together in a classified collection, or just want a good library drama for the holidays (admittedly more 20th-century than, I hope, our 21st-century approach), try Stephen Poliakoff’s 3-part BBC drama, Shooting the past. (Viewers from UCL or other subscribing institutions can view this on Box Of Broadcasts. We’re getting into the Christmas spirit here at UCL Institute of Education Archives and thought we’d share this historical Christmas greeting with you all! 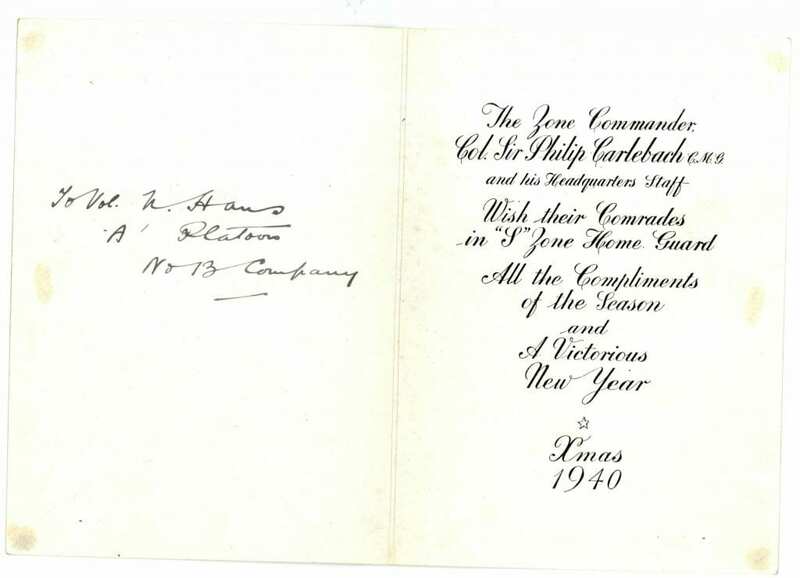 This Christmas Card was sent to Nicholas Hans by the Home Guard, which he joined on its formation in 1939. Nicholas Hans was born in Russia and came to London in 1920 where he started working at the Department of Education in Kings College. 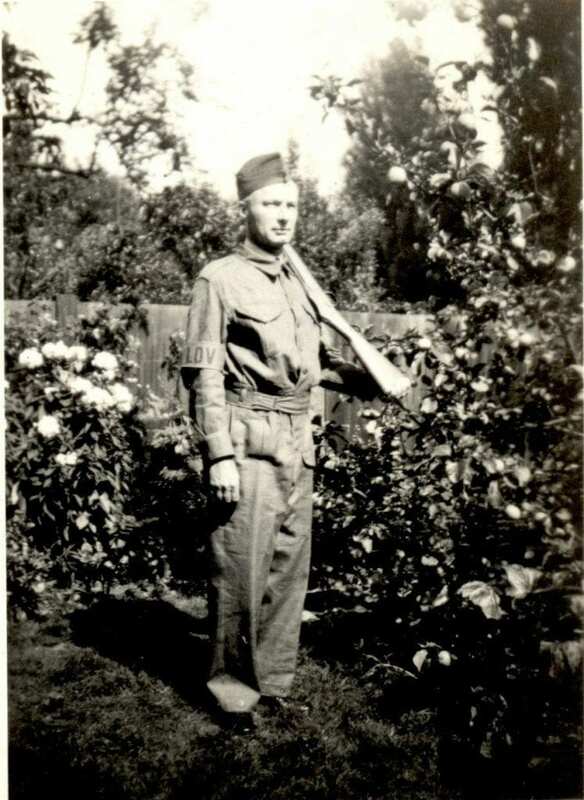 During the Second World War he worked as a civil servant in the Censorship Department of the Ministry of Information and, as we found out when cataloguing this material, he was also a member of the Home Guard. In 1946 he was appointed as lecturer at King’s College, becoming a Reader in Comparative Education in 1948. 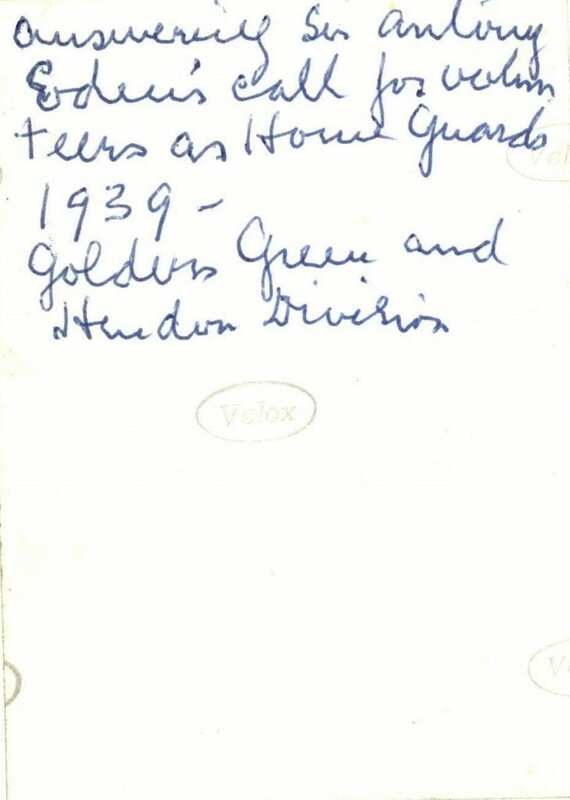 During this time he collaborated with Joseph Lauwerys at the Institute of Education in supervising higher degree students and arranging overseas trips, and he continued these activities after his retirement in 1953. He wrote and published on a wide range of topics, including comparative education, educational policy in Russia, and the history of Russian and eighteenth century education. The Papers of Nicholas Hans have been held, and catalogued, by UCL Institute of Education Archive since the 1970s but I have recently just added three boxes of material to the catalogue so this seemed like the perfect opportunity to highlight this interesting collection, and an excuse to use this Christmas card which we all really liked! The additional three boxes of material includes some really fascinating material including: Visa application for Nicholas and Grace Hans to come to Britain from Russia in 1920; correspondence with other leading educationists including Friedrich Schneider, George Z F Bereday, Sergei Hessen, Edmee Hatinguais and H C Barnard; photographs of work trips abroad; letters sent to Grace from conferences abroad, family photographs and these Home Guard photos; hand-drawn magazines created by Nicholas Hans while waiting in Istanbul for entry to Britain in 1920; block printed Christmas cards from Arcangelo & Eda Cascieri (Arcangelo and Eda were both artists & Arcangelo was Dean of Boston Architectural Centre); and notes and drafts of articles and books by Hans. 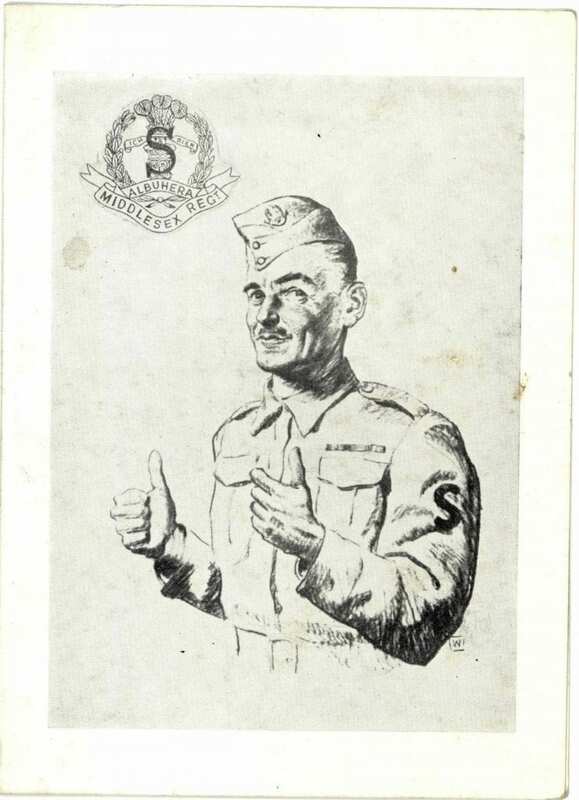 You can find out more about the Nicholas Hans collection on our libguide or through the archive catalogue. There is also a Nicholas Hans Special Collection, which contains books bequeathed to the Institute of Education by Nicholas Hans, mostly on comparative education. I’m sure I’ll be sharing more items from the newly catalogued material in 2017 as it was full of so much fascinating material! So Compliments of the Season to you all and best wishes for a Happy New Year!